The Reformation Commentary on Scripture Series by InterVarsity Press follows the course set by the successful Ancient Christian Commentary Series. Each individual volume compiles written commentary or relevant allusions from multiple writers, pastors, theologians, and teachers. In the case of the Reformation Commentary, the wide range of Reformed voice is capable of shining valuable light on the texts of Scripture. 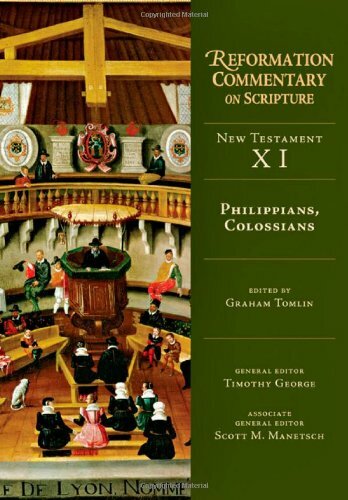 In the Reformation Commentary on Scripture: Philippians and Colossians (henceforth RCSPC) introduction, editor Graham Tomlin notes that “Scripture, for these authors, is not a static text to be approached one-dimensionally” and that the best commentaries “are not those that exhibit the most pristine academic neutrality, but that handle Scripture as the Word of God” (xliv). To this end despite their differences, the multiple traditions present in RCSPC provide valuable commentary for reading, even when there are practical disagreements. Some of the contributors includes Georg Major, Martin Luther, and Philipp Melanchthon (Lutheran), Heinrich Bullinger, Wolfgang Musculus, and John Calvin (Reformed), Thomas Muntzer (Anabaptist) and finally Thomas Wright and William Perkins (English reformers). These and others represent a wide range of doctrinal beliefs, life experience, culture, and era. It is common throughout RCSPC to read six to eight of these different voices on any particular text. When it comes to the doctrine of Paul’s epistle to Philippians and Colossians these differences are at times quite broad. Very early in the commentary on Philippians, Georg Major provides a great example of the “law/gospel” hermeneutic of the Lutheran tradition (7-8). Major (Germany, 1502-1574) also provides a most interesting quote, revealing his time period, when he refers to humans as “pathetic excrement and maggot-sacks” (48). Discussing the same passage, English reformer William Perkins (England, 1558-1602) demonstrates a definitive language change when he refers to “secure and drowsy Protestants [who] think themselves blessed” (49). Philipp Melanchthon, who’s work Scholia in Epistolam Pauli ad Colossenses “is used extensively in this volume” (xlvi), provides similar insights in Colossians (199-20) and proves to be the most commanding voice among many capable commentators (e.g 126-127, 222-223). The great strength of RCSPC is the numerous views of key doctrines taught in Paul’s epistles. Knowledge and Divine wisdom (Colossians 1:9-10; 140-143), the doctrine of baptism—featuring a long quotation from Luther’s Large Catechism—(Colossians 2:11-12; 187-193), and the doctrine of Christ’s presence and the Lord’s Supper (Colossians 3:1; 210-212) all provide excellent showcases for the occasional disharmony among Reformation interpretations. In addition to the provided commentary, RCSPC offers a “Timeline of the Reformation” (254-263) and “Biographical Sketches” (264-285). These help introduce some of the less known voices from the Reformation. In conclusion, the Reformation Commentary on Scripture: Philippians and Colossians is outstanding. The wide range of voice and views available on the Reformation are brought together in a wonderful presentation for teachers and preachers.